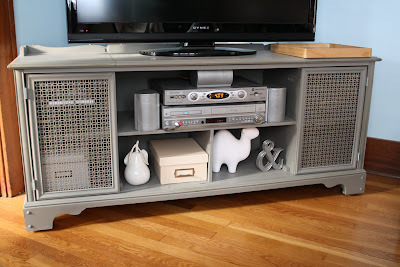 I had never really painted furniture (unless you count a shabby-chic little cabinet from our Cincinnati apartment...which you really shouldn't count), so I was a little nervous about getting it all right. But fortunately, I have a friend in the blogging business that is THE expert in this kind of thing. 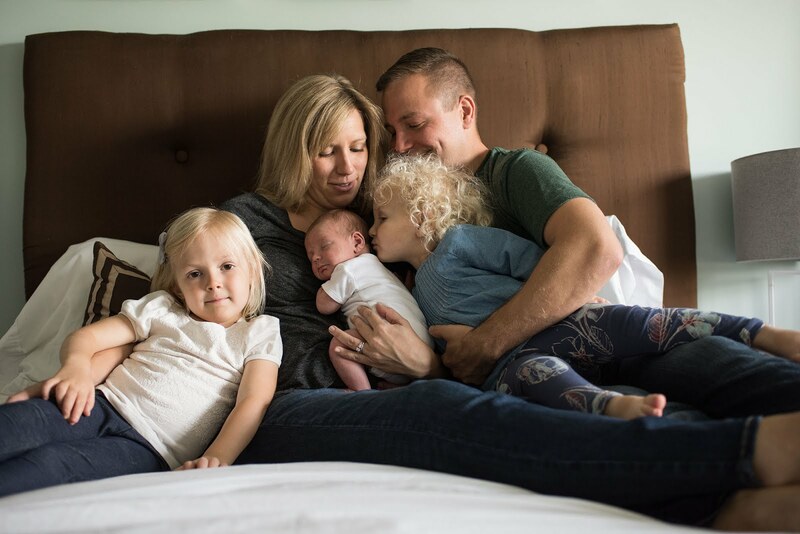 Have you heard of Barb Blair from Knack Studios? If not....you're missing out. She is a sweet, talented, crafty-genius of a lady, and our paths crossed on a work project a while ago. (I call her a "friend" but she's really an internet celebrity who is nice enough to email back and forth with little old me.) I showed her a picture of our find, and explained the plan- I wanted to remove the (fake) doors on the front, add shelving, and paint the entire thing a warm gray. She gave me a few tips, and coincidentally, had just written an online tutorial for just this type of project. Score! So now that I was armed with knowledge and a vision, and Dustin was armed with...well, his arms, we were ready to roll. Oh- and I should mention that we completed this entire project in our foyer....Crazy, and a little dumb, but true. After that, we removed the backer piece, and cut the front panel off. The front was made to look like doors, but they didn't actually function, so we cut them off to expose the large storage area in the middle. Dustin was able to get them off without damaging the rest of it...which I'm sure was no small feat. 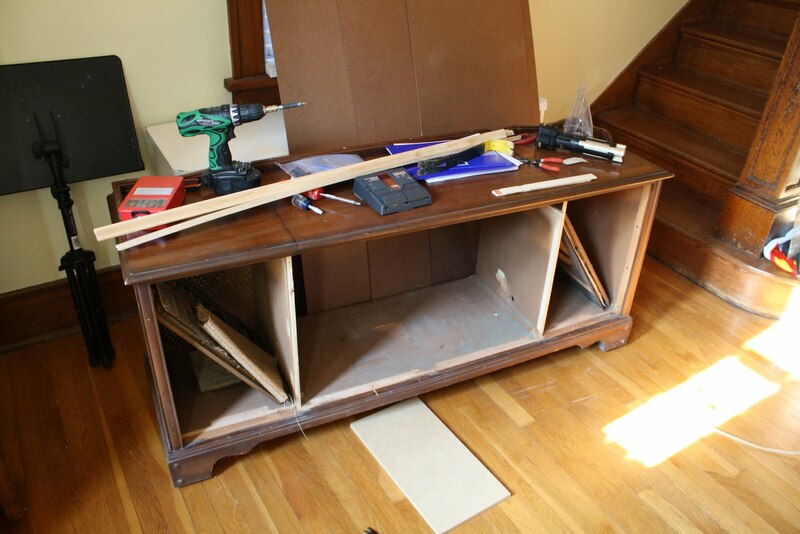 Now that we had an empty frame to work with, he added some MDF shelves across the entire piece, and one to stabilize it in the center. 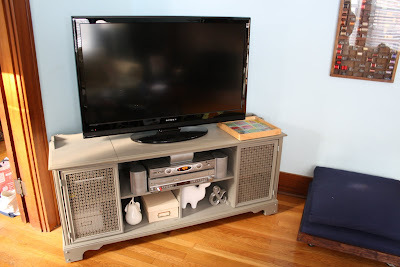 The divisions weren't exactly what we might have dreamed up, but it would be able to house our cable box and DVD player in the center, which was the basic need. And staying true to the original design helped make the entire process easier and more stable. Time for paint! We followed Barbs instructions which made it quick and easy. We got the whole thing done in an evening, and then followed up by distressing it a little later. And for the final detail, Dustin built new doors, to close off the side portions. 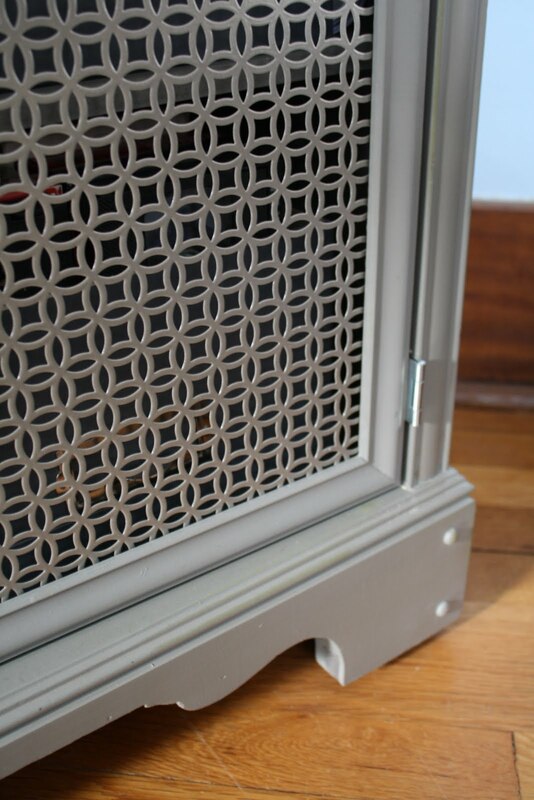 I thought it might be fun to add a little bit of pattern and interest to our otherwise blocky piece, so we used pieces of radiator screen for the door panels. He encased them in some decorative trim, and painted them to match. 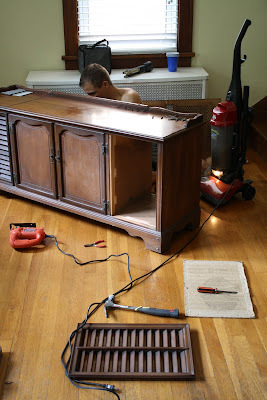 Then it was just a matter of cutting a new back panel, and voila...we had a fully functioning piece of furniture again! Oh- and I love its little feet! Isn't it beautiful? In addition to the $15 we paid for the piece originally, we probably spent another $50 or so on materials to fix-er-up. Not too bad, considering what a full price item would have set us back. We're still experimenting with how to fill the bottom shelves, but for now they are a great home for my growing pear/ceramic animal/ampersand collections. (and hold a box containing all my camera doo-dads). And the side portions provide much needed storage for our various gaming systems and DVDs. 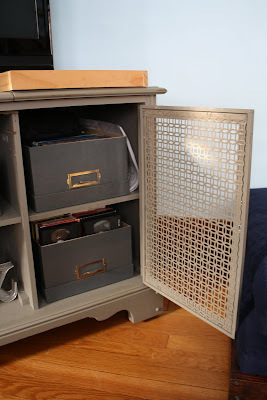 I was worried that I wouldn't like seeing through the doors, but with the right color storage boxes, you can't really even see them....and if we want to, we could always back them with something later- to keep the pattern, but lose the transparency. I'm so proud of it...and my husband, for all of his hard work. So proud that I think I might settle down to watch a Real Housewives marathon. I mean, I have to spend time marveling at his handiwork, right? Wow, impressive work, Bowdens! Really, super impressive! I love Craigslist. My current dining room table is a Craigslist find. It's the perfect table for us right now where we are. 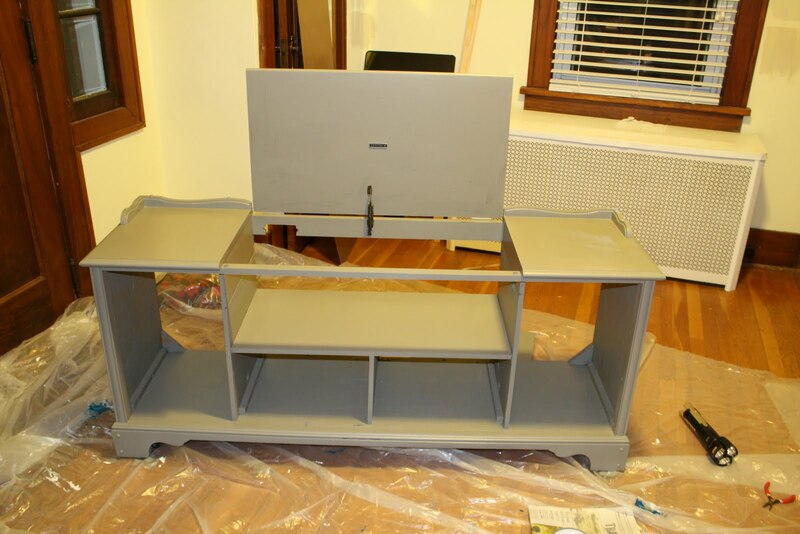 I am inheriting a roll top desk from a friend, but it needs refinished...any tips? 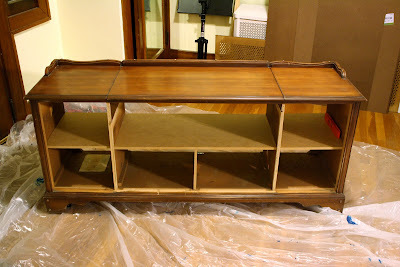 It will be my first refinishing project. I'm going to read up on it and see if there's even a Youtube clip or somehthing because I don't want to mess it up! Where is all of Dustin's safety gear? Probably right where he left the rest of his clothes??? I love the cabinet. Love it. You both did a fabulous job. My favourite part is the radiator screen on the doors. And the colour. 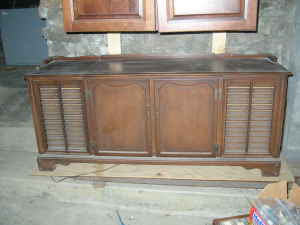 Oh, and the fact that we had one of these in my house when I was a kid (yes, I'm that old!). What a great project! It looks fantastic. I have been planning on doing a media center with the grill similar to that, do you mind telling me where you got the grill at? Thats quite a fantastic piece!!! Where did you find the radiator cover? I was going to use chicken wire for a project but this is soooo much better!!!! After seeing your fabulous before/after on before and after, I scrounged up my own console stereo for conversion to a tv stand. I've gutted the electrical, but wonder if you have any tips on how to get the front panel off. It seems to be all one piece (like yours it has faux doors), and I'm not sure how to get it out without damaging the rest of the unit. I'd love any tips you could spare - the more specific the better! 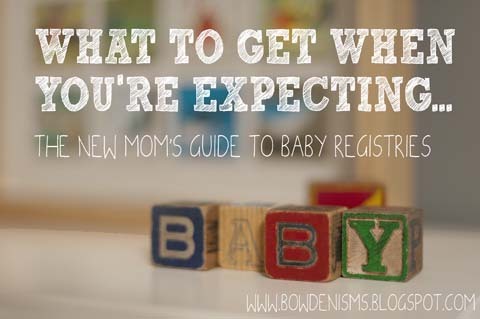 Just saw this on the Better After blog. WOuld you mind sharing the paint color? I'm thinking of painting our bathroom vanity a warm gray. Thanks! Great resurrection! 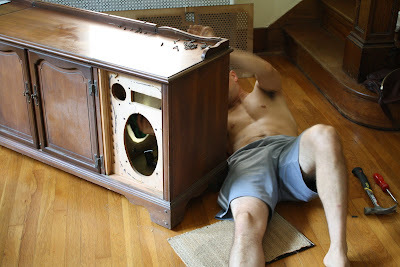 I've also got one of the old stereo cabinets and had been thinking about converting it and now I've seen how. I'm with the others - what colour and type of paint is that grey? And same as Jenny, how did you guys get the front off without ruining everything around it? I'm new to your blog and am enjoying it lots!! Sorry for the delay in answering questions ladies! 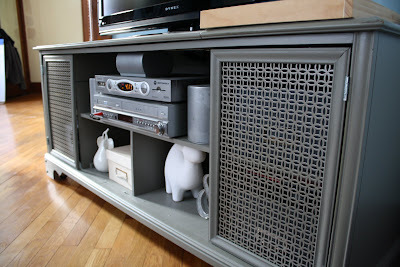 The paint is Behr, but because it was custom matched to a Martha Stewart color I don't have a record of it. I believe it's either Zinc or Mushroom. They're both really beautiful rich colors, so you can't go wrong. 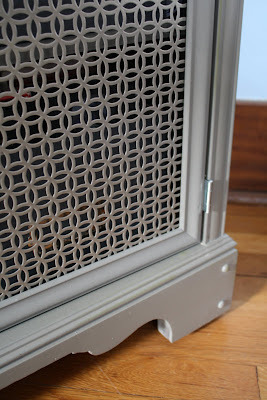 The radiator screens are available at Lowe's or Home Depot. They're a little tough to find, especially because the employees never believe that they're a real thing- but be patient, and persistent, and you'll find them. As for removing the front- it depends on your specific piece. Again, it's partly a matter of patience. If you cut carefully you can keep any trim portions in tact, and any minor issues you can fill/fix before painting.